3D printing is instrumental in next generation pharmaceuticals and regenerative medicine. The flexibility of the technique allows it to be used in a number of ways from providing the perfect microenvironment for living cells, to microfluidic chipsideal for testing and creating new chemical compounds. However, a team at the University of Twente (UT), the Netherlands, noticed some shortcomings in conventional medical 3D printing techniques. In a method termed “in-air microfluidics” the UT team have developed a new, and entirely unique 3D bioprinting system that works by colliding particles in the air. 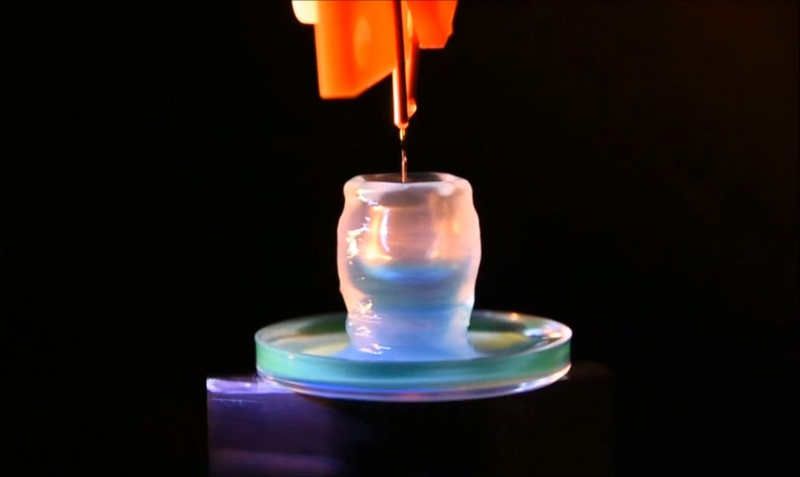 As seen the video above, in the UT setup a petri-dish spins on a kind of “potter’s wheel.” The dish acts as a substrate for materials, and sits below two pin-sized nozzles that make the machine’s print head. Each of the pins is loaded with a different material, one that solidifies on contact with air, and the second a substance to be encapsulated. For demonstration purposed, the encapsulated substance is a CaCl salt, but the vision is that this could be replaced with, for example, a cell-laden ink. Jetted at high speed from each of the nozzles, molecules of each material combine in the air as it acts as a channel. Particles stick to the dish on contact where they form layers to make a gelatinous free-standing structures. The centrifugal force pushes the particles out to make a hollow tube, making a valuable “building block” for further medical research, i.e. cultivating cells into tissue. A seemingly haphazard approach, the combination of jet streams and the rapidly rotating dish creates a liquid-filled foam microstructure within the gel. The pores in this foam are microscopic, producing a scale closer to the body’s natural cell structure. By adding a mold to the spinning wheel, the researchers are also capable of making more complex 3D structures, e.g. bone. The combined particles also offer a new potential method of making emulsions – mixtures commonly used to make cosmetic and pharmaceutical products.